It isn’t very often you see a horse defeat one of his progeny in the top class at any track. But when the classy 10-year-old Daylon Magician did just that on Tuesday night at The Raceway at Western Fair, he put an exclamation mark on his victory by going over the $2 million mark in earnings. The unaltered son of Kadabra out of the Super Pleasure mare Daylon Marvel had no problem repelling his four-year-old son Scene A Magician, despite that gelding’s audacious first-up move on his old man in the third quarter of the Preferred 2 trot. A storybook father/son exacta finish would have to wait for another day as Scene A Magician – himself out of the Cherry Hills dam Scene Duharas – would finish third, nipped for place by 46-1 shot On The Ridge. The winner’s share of the $11,500 purse made Daylon Magician a double millionaire. The 1:59.2 win was the 33rd victory in Daylon Magician’s illustrious 83-race career in which he tallied triumphs in the Ontario Sires Stakes Superfinal in 2010 and the Canadian Trotting Classic, Goodtimes stakes and Canadian Breeders Championship in 2011, to name a few. Owned, trained and bred by Dave Lemon, Daylon Magician was making just his second start of the season after standing stud the past two seasons. A thread was started in the Facebook Harness Racing History group asking if anyone had heard of other stallions that came back to race and faced their offspring. Bob Marks noted that Rendezvous Truder faced son Rendezvous Mark, although Truder was gelded by that time. Sturla Pettersen mentioned that Timoko faced his son Dreammoko in the 2017 Kymi Grand Prix in Finland. Richard Young also contributed to the thread. “I would bet virtually no one remembers or even knows this sire who came back to race against his son,” he said. “The sire was Le Lion. He was one of my favorites. The son was Baby Lion.” Keith Gisser noted that Lather Up’s sire, I’m Gorgeous, was beaten by one of his daughters in the Free For All at the Lake County Fair this summer. 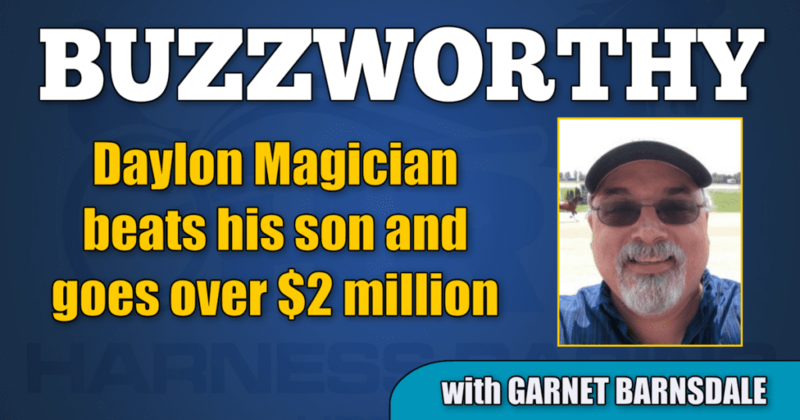 But the buzz on Tuesday night belonged to Daylon Magician, who passed a major milestone while putting his son in his place.